Have you been following the World Cup? If you have you know that the US team has done very well. They’ve made it out of the first round. In fact, they won their group. If you haven’t been following the world’s most popular sporting event, let me give you a little background. Thirty two teams qualify for the tournament through a long series of preliminary matches. Once the thirty two teams are set, they draw lots to see who plays who in the first round. There are eight groups of four teams each. With me so far? Good. Each team plays the other three teams in their group. The winning team in each first-round game gets three points. A tie is worth one point. At the end of the first round the two teams in each group with the most points go on to the second round. If we were in England, or Ireland, or just about any other country in the world I wouldn’t have to tell you this because you would already know it. Because we have baseball and American football and basketball and hockey, soccer isn’t nearly as popular here as it is in most other countries. While it’s possible for an American athlete to make a lot of money playing soccer, they almost always have to leave the country to do it. So, most of our top athletes are playing other sports. That’s one reason why our experience in the World Cup hasn’t always been great and why our American players have to work very hard to earn the world’s respect and the respect of our own American sports fans. This year’s World Cup has been no exception. In the first game, America played a heavily-favored English team. We haven’t beaten England in a cup game since 1950, sixty years ago. England scored just four minutes into the game, definitely not what the Americans were hoping far. But they battled back, scoring just before half time and holding on for the second half to earn a one all tie and a point in the standings. The USA’s second game was against Slovenia. Again, they gave up an early goal just thirteen minutes into the game. Before the end of the half Slovenia would have a two to nothing lead. But again the Americans came back, tying the game. It looked like they scored another goal but the referee disallowed the third US score. Instant replay showed that it was a good goal but soccer doesn’t use replays to reverse referees’ decisions and the Americans had to settle for another tie. The USA’s third game was against Algeria. A win meant they would move into the next round. A loss or a tie meant they would go home. This time they didn’t give up an early goal. In fact, they didn’t give up a goal at all. Twenty minutes into the game the good guys scored what looked like the go-ahead goal but for the second game in a row, they had a goal disallowed on a questionable call. As it turned out, the Americans refused to give up, dominating play for the rest of the game but still not scoring. Then, in the 91st minute, Landon Donovan scored for the US, winning the game and winning the group with a total of five points. You’re probably wondering what any of this has to do with our reason for gathering around the Lord’s altar today, but bear with me for a minute and I think you’ll get my point. The American team has faced a lot of adversity, not just in the last two weeks, but over the years. They play for a country that’s mostly indifferent to their sport. The World Cup is the biggest sporting event on the planet. Billions of people world-wide will watch it on television. Yet in the United States most of the games are only available on cable or on the Internet. When they got to the actual Cup tournament, they had not one but two goals called back, both on terrible calls by the officials. But they didn’t quit. They didn’t give up even though no one would have blamed them if they did. While the rest of us were yelling at the television knowing that the soccer gods had turned their backs on the United States…..again, the team handled themselves with class. They saw the two ties as two glasses half-full, not half-empty. Their outstanding goalkeeper was hurt in the very first minutes of the tournament but he played every minute of every first-round game and kept the US in every match. Here’s where we get to the comparison with our faith journey. It’s not easy. Look at what Jesus tells the disciples in today’s Gospel. “Leave your family.” “Let the dead bury their dead.” “No one who looks to what was left behind is fit for the kingdom of God.” That’s tough stuff. He doesn’t want 90% of me or even 95%. He wants it all. 110%! Nothing less will do. Keep your eye on the prize. The World Cup is the most coveted trophy in all of professional sports but it’s just an over-sized paperweight compared to the prize that Jesus has in store for us. 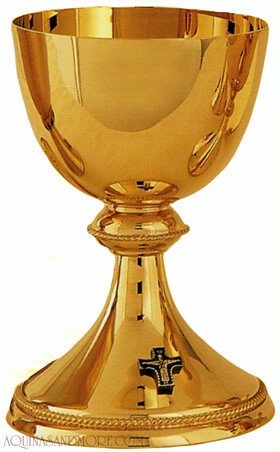 It’s not just the World Cup, it’s the cup of eternal life. One of the things that makes the World Cup such a big deal is that it’s only played once every four years. If you mess it up, it takes a long time to get back. But our cup is only offered once. It’s a long journey, but when it’s over, it’s over. Either you advance to eternal life, or you don’t. There WILL be setbacks. Life won’t always seem fair. We may not always have the support of our friends or even our families. Our Catholic beliefs may not always be popular. But the prize is waiting for us. Shouldn’t we give it everything we’ve got? Sports is often a metaphor for life. There are good guys and bad guys, winners and losers, heroes and goats. The best team usually wins, but not always. We learn from our victories AND we learn from our defeats. Look at John and James in our Gospel story. They’ve been sent to a Samaritan village, sort of advance men for Jesus. The Samaritans turn them away. Big surprise! Samaritans and Jews weren’t exactly best buddies. Jews normally went around Samaria on their way to Jerusalem. John and James respond by asking Jesus if they can call down fire and burn the place down; a bit of overreaction, I think. Fortunately, Jesus has a little more reasonable response. Let’s just go somewhere else. It was a learning experience. If someone turns you away, you go someplace else. You don’t go around setting people on fire. Sometimes the Apostles seem a little dense, but then so do we. Turning the other cheek can be the most demanding physical action of all. If you and I are going to spend eternity in the presence of God, we have to work hard. We have to know what Jesus and the Church teach and we have to do our best to follow those teachings, not just on Sunday, not just sometimes, but every single day. When Jesus said “You are my friends if you do what I tell you”, He didn’t mean just once in a while. Let me go back to the sports analogy for just a minute. A lot of you know I used to be a soccer referee here at Saint Bernadette and some other places. I gave it up when Missouri passed the concealed carry law. All four of my kids played the game (one still does) and all of them refereed. I used to tell them that, with very few exceptions, no referee, or umpire, or other sports official can determine the outcome of a game. It’s how you respond that makes all the difference. Yes, the United States team got a couple of tough breaks, but they played on and in the end they won their group. Sports, like life, has a way of evening things out over time. You learn from your mistakes, you get better at what you do, and sooner or later the breaks will start coming your way. Nothing in the world can take the place of persistence. Talent will not: nothing is more common than unsuccessful men with talent. Genius will not: unrewarded genius is almost a proverb. Education will not: the world is full of educated derelicts. Persistence and determination alone are omnipotent. “Omnipotent” According to Webster it means ” having virtually unlimited authority or influence.” Capitalized it means “almighty.” So, at least according to our thirtieth president, persistence has unlimited authority or influence. Today we say walk the talk, or keep on keeping on. Never quit. Never give up. If you do, your persistence will be rewarded with a seat at God’s heavenly table. [Note: This homily was written before the US lost to Ghana in overtime on Saturday. Even though the Americans are on their way home, I stand by my observation that they went as far as they did on hard work and persistence. The fact that they made it to the knock-out round has to be considered a good outcome for the US side even though they and their fans hoped for more. There seems to have been a lot of press coverage recently on the upcoming changes in the mass. 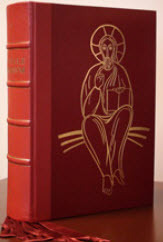 Beginning with the First Sunday of Advent, 2011, we will begin using a new translation which changes some of the prayers and responses of the mass. The changes are supposed to bring the English translation more into line with the original Latin text. They will be small, but significant changes and they will take some time to get used to. Having said that, it seems that many in the media, and in the Church, are jumping the gun. Many (most?) people don’t like change, especially in something as important as the mass. There may be some resistance, but face it, the change is going to happen. But, and this is important, the change isn’t going to happen until December, 2011, eighteen months from now. A lot of water is going to pass under the bridge between now and then. Of course things happen slowly in Holy Mother Church and some things must be set in motion months ahead of time, printing thousands of “New” Sacramentaries for example. But for you and me, the time to start looking at this change seriously is a year or more away. For the time being, let’s just enjoy the mass as it is, as it’s been for the last forty years ago or so. We have three periods of ordinary time, one lent, one Easter Season, and one Advent to go using the present translation. Let’s just all chill out. If you’re interested, the USCCB has created a web site on the new translation. You can check it out here. But, take your time. One more thing: The USCCB site lists a schedule of workshops for “Priests and Diocesan Leaders.” I guess deacons don’t count. I’m just sayin’…..
Down through the ages there have been a lot of false prophets. If that weren’t true then there wouldn’t be the thousands of different belief systems in the world today. And, there are no shortage of them today! In fact, I’d say we’re up to our necks in false prophets with new ones coming along almost every day. Some of them may even claim to be members of the Church. “Pro-choice Catholics” for example. As Jesus says, “Beware!” Do your homework. Don’t let a charismatic speaker lead you astray with his eloquence and the enthusiasm of his followers. You have all the information you need in the Bible and the teachings of the Church.